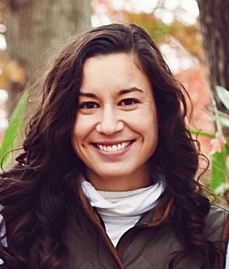 Kathryn Henley is a doctoral candidate at the University of Alabama at Birmingham. She studies pain in animals, currently pigs, trying to understand the different and often subtle signs that animals may be in pain. In this post, she explains why her research is important – both to the development of good animal welfare and the development of better pain management in humans. Ten years ago, my dad fell off a ladder while he was cleaning the gutters on our house. Although he only fell five feet, the position in which he fell broke vertebrae in his neck. He was taken via MedFlight to a specialty hospital, where a neurosurgeon diagnosed him with a C4/5 complete spinal cord injury. In simple terms, he was paralyzed from the chest down and could not move or feel anything below that level. One unfortunate side effect of spinal cord injury is that while the ability to feel internal stimuli (e.g., needing to go to the bathroom) and external stimuli (e.g., someone touching your hand) is lost, the majority of people with spinal cord injury live with the feeling of pain. This pain is usually severe and can significantly affect their physical capabilities, mental and emotional health, and social activities. For example, my dad’s pain made it extremely difficult for him to participate in rehabilitation. I would often bring him to physical therapy where he would sit with cold packs on his shoulders instead of performing exercises to help him regain function. The medications available to treat pain after an injury to the central nervous system are few. Most of the medications my dad tried failed to provide adequate relief, and the few that did were highly addictive or left him feeling “out of it.” He usually chose not to take his medication and to live with the pain rather than dealing with the side effects. I find the lack of effective therapeutics for pain extremely frustrating. If the number of preclinical studies of pain is increasing, why haven’t they translated into pain relief for people like my dad? In general, pain is extremely hard to measure. There is no biomarker for pain and we can’t ask the animals how they are feeling or have them fill out a survey. However, we can make observations about their behavior. One way pain is assessed in animals is measuring withdrawal reflexes. This is the same reflex that humans experience when we touch a hot stove and immediately pull back our hand. However, this is a spinal reflex that occurs so quickly, it happens before the feeling of pain reaches your sensory cortex. This is problematic for the study of pain after spinal cord injury because axons in the spinal cord that carry pain signals to the cortex may be damaged. In other words, the injury may prevent pain information from reaching the brain even though the withdrawal reflexes remain intact. Therefore, we can’t assume that there is pain sensation below the level of a spinal cord injury even if there is a withdrawal reflex. Additionally, the most devastating part of living with pain is the physical, emotional, and mental effects of feeling the pain, not withdrawal responses. My research focuses on behaviors in animals that tell us when there is a “feeling” of pain that reaches the sensory cortex and then results in a behavioral reaction. The first behavior I examine is the “pain face,” also known as a grimace. When humans are in pain, we grimace by narrowing our eyes, wrinkling our nose, and raising our upper lip. Animals also grimace by changing certain parts of their faces, including their eyes, ears, cheeks, and nose or snout. An assessment called the grimace scale was first developed in mice by Dr. Jeffrey Mogil at McGill University in Canada. The grimace scale has since been translated to rats, rabbits, cats, pigs, sheep, and horses. Researchers have found that mice with lesions to their insular cortex don’t grimace. Because the insular cortex is involved in the emotional component of pain in humans, this may indicate that grimacing reflects the emotional effect of pain. Example of the Rat Grimace Scale. 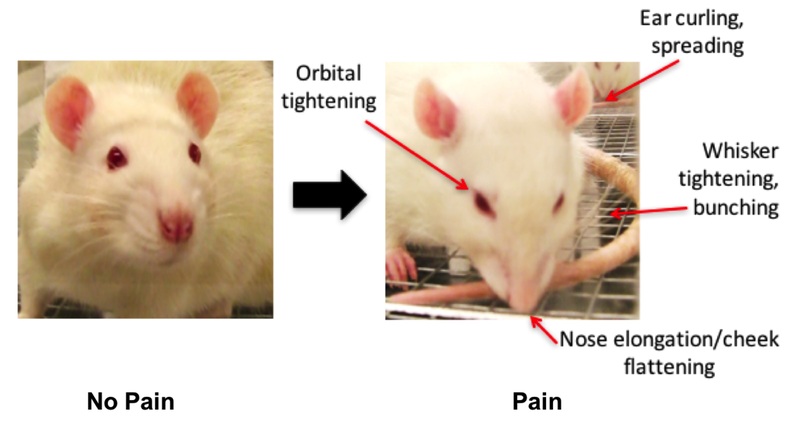 There are four action units in the rat’s face that change with pain: the eyes, ears, whiskers, and nose/cheek. Image source: K. Henley, unpublished. I also use vocalizations to measure pain. Some animals vocalize to communicate when they are in pain because this ultimately benefits them and promotes the survival of their species. However, other animals like mice and rats may not vocalize when they feel pain because this would attract predators. Right now, I am characterizing the vocal repertoire of pigs. This means I record all the sounds that pigs make and classify them based on how they sound and look on a spectrogram. Sound analysis software enables me to analyze different components of their calls in detail, so I can determine even slight differences in duration and frequency. Knowing all their calls will allow me to better assess differences when using their vocalizations as an outcome measure. So far, I have characterized 16 different call types. 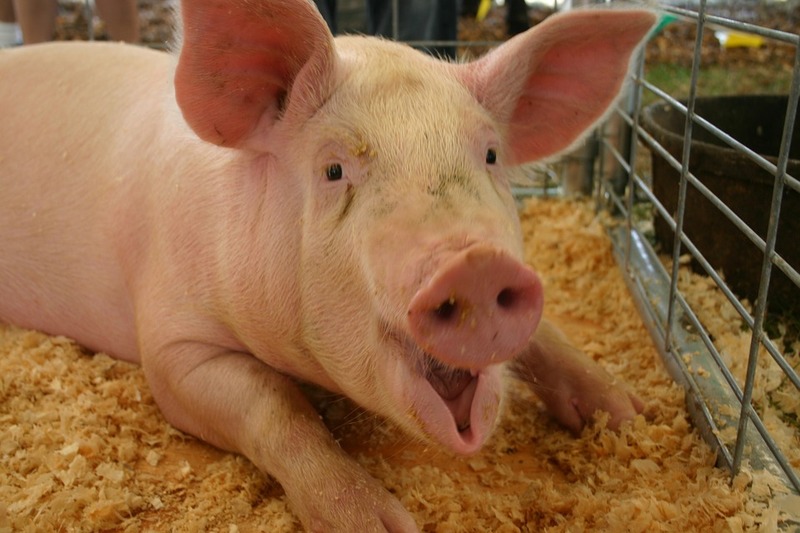 Did you know that pigs bark?! One important consideration when assessing pain is the confounding effect of other mental and emotional states, such as stress or anxiety. Animals may behave differently because of stress, regardless of whether they are in pain or not. As such, we take extreme care to ensure our animals feel safe and comfortable in their environment. We allow the animals to acclimate to their new space for three days after their arrival, without any interaction with study staff. On the following days, we slowly habituate them to our presence by offering treats and other positive reinforcement. We do not begin any study-related procedures until each animal can be calmly approached and touched by the investigators. Many prey animals will hide signs of pain from predators; therefore, it is vital that our animals do not feel threatened at any time. In fact, the pigs enjoy our presence very much (as it typically accompanies food) and I enjoy spending time getting to know each individual animal. They are also acclimated to any rooms, equipment, or procedures they will experience in the study to reduce any effects from stress or anxiety. I love my research because it serves a dual purpose: to help both animals AND people like my dad live pain-free. The more I learn about animals and their behavior, the more information there is to guide animal welfare policies in both biomedical research and the production (farm) industry. This means that scientists, veterinarians, laboratory animal technicians, and farm personnel will have access to better tools to assess whether an animal is pain and if a pain medication is working. In addition, more accurate assessments of pain will lead to more valid results from preclinical studies. This means that people like my dad will have better options to help manage their pain and be able to achieve a better quality of life. Previous Previous post: Research Roundup: Possible cure for genetic infertility, zebrafish as a model organism for cancer and more! Next Next post: Research Roundup: Ecstasy to be used to treat PTSD, stem cell therapy reducing symptoms of Parkinson’s disease and more!